New research reveals that symbols which appear on ancient Georgia pottery are identical to Mayan glyphs, the symbols used to write the Mayan language. The pottery known as Swift Creek was a highly decorated form of pottery produced around 2,000 years ago beginning around 0 A.D. Many of the Swift Creek designs were collected in the book A World Engraved: Archeology of the Swift Creek Culture where several researchers noted the similarity in designs with Mexican symbols although this was dismissed as purely coincidental by academics. Yet the latest research proves they are Mayan glyphs adding yet more evidence of a Mayan presence in Georgia. Over the past three months the internet has been abuzz with the idea that the ancient Maya once lived in Georgia. It started when a Georgia architect announced that he’d discovered a possible Mayan village in the mountains of north Georgia. This story was followed up by another researcher who claimed there were many Mayan words in the language of Georgia’s Hitchiti-Creek Indians as well as early European eyewitness accounts of Mayan gold mining operations in Georgia’s Appalachian mountains. Another recent announcement about the discovery of a possible source of the important pigment known as “Maya Blue” in southwest Georgia has added more fuel to the fire. Mayan Glyphs on Swift Creek Pottery? The new research analyzed the Swift Creek symbols and compared them to Mayan glyphs from a Mayan glyph dictionary. What this analysis found was that many of these Swift Creek symbols were identical to Mayan glyphs. 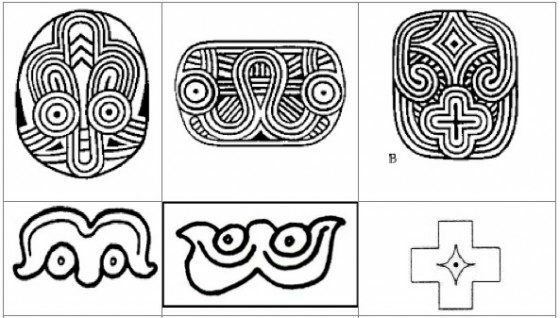 (Read: “Mayan Glyphs on Georgia, Florida Pottery.”) For instance, the Maya had several glyphs for their word ek which means “star/Venus.” One version looked like a lower case W. Another version was diamond-shaped while yet another version was cross-shaped. The analysis found that all of these versions of the Mayan Venus glyph appeared on Swift Creek pottery. For example, one Swift Creek design looked like a lower case W and included two circumpuncts or circled-dot symbols. These symbols are known to represent stars among Georgia’s Indians. The researcher noted that although the meaning of this Swift Creek glyph was unknown, it was logical to assume it had a stellar interpretation because of these two star symbols. The fact that there were two such symbols on this Swift Creek symbol and Venus also has a dual nature as the Morning and Evening star, the researcher deduced that this Swift Creek design could represent Venus just like the similar w-shaped Mayan glyph. Another Swift Creek design featured both a diamond-shaped design and cross-shaped design within a single cartouche. Once again the researcher noted that although the meaning of this Swift Creek design was unknown, one could deduce that both symbols represented similar or identical ideas; otherwise, why include them in the same cartouche? Both of these symbols were used independently as well as together by the ancient Maya to represent Venus. Thus the Swift Creek design is entirely consistent with this philosophy and thus likely represents Venus as well. Perhaps the most intriguing Swift Creek design that the researcher uncovered appeared to represent a jaguar with a cleft head. It also featured a flint knife symbol in the center of the design. Yet when the design was rotated 180 degrees it took on the appearance of a rattlesnake head complete with forked tongue. The research reveals that this design likely represents the Mesoamerican legend wherein the jaguar god Tezcatlipoca battled the plumed rattlesnake god Quetzalcoatl. The battle resulted in a rain of stone axe heads which struck Tezcatlipoca transforming him into a jaguar and causing the cleft in his head. 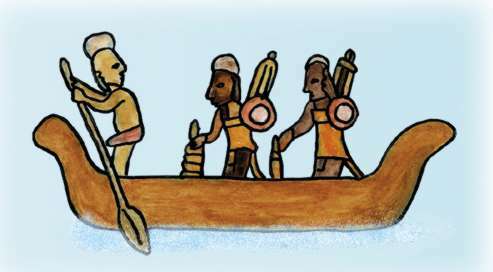 Tezcatlipoca was also strongly associated with flint knives. Thus every element of this Mesoamerican legend is represented in the Swift Creek design. One of the largest collections of Swift Creek pottery was unearthed at the Kolomoki Mounds site in southwest Georgia. 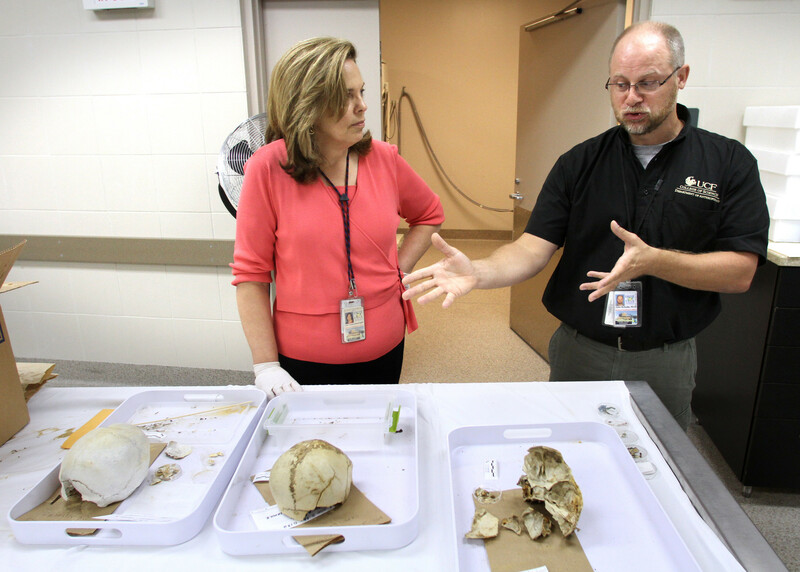 This site is located just miles from the previously mentioned source of “Maya Blue”pigment. Archaeologist Thomas Pluckhahn noted in his book Kolomoki: Settlement, Ceremony & Status in the Deep South, A.D. 350-750 that Kolomoki was the largest and most popolous town north of Mexico during its time period. The site featured an enormous earthen pyramid over six stories tall with a base larger than a football field. It was stuccoed with both red and white clay so thick, in fact, that archaeologists joked it would take an earthquake and dynamite to ever break through it. Researchers have long been puzzled by the location of such a large town in a relatively isolated location. The discovery of the Maya Blue pigment mines located nearby may finally answer the question of its size and location as well as explain the Mayan glyphs on its pottery. At the same time that Mayan glyphs began appearing on Swift Creek pottery, construction was underway in Mexico on two of the largest cities on Earth: Teotihuacan and El Mirador. Building projects of this scale would have undoubtedly forced the builders to source materials far and wide just like comparable building projects of today. Georgia has the largest source of Maya Blue pigment, mica (Teotihuacan featured tons of mica), and gold. A city the size of Teotihuacan would have had enormous markets and its citizens would, like modern people, have wanted all kinds of goods which would have had to have been sourced from somewhere. And once all the local sources were monopolized by various elite families, traders who wanted to strike it rich would have to look elsewhere for new sources. 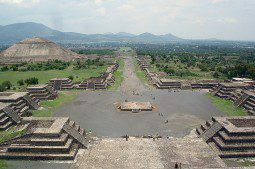 Interestingly, Kolomoki Mounds collapsed at the same time that riots took place in Teotihuacan which resulted in the destruction of the elite quarters around 500 AD. These elites were likely murdered as well which would have disrupted any trade they were involved in. Did Kolomoki loose its biggest trading partner and thus become a ghost town? Plenty of questions still need answering. 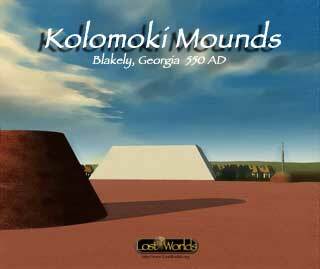 The Kolomoki Mounds Historic Site has preserved these ancient earthen pyramids and mounds for the public. The park also features a museum where examples of Swift Creek pottery can be viewed. The park also features cabins and campsites. It is located approximately six hours southwest of Atlanta and thus makes for a great weekend road trip. There is much more evidence of this Mesoamerican connection which I will cover in future articles. Until then you can find me on facebook, subscribe to my newsletter, watch my DVD Lost Worlds: Georgia or find out more about my upcoming book, Maya In America: The Untold Story of Ancient America.